Home Uncategorized Does Chávez want a proxy war in Honduras? Does Chávez want a proxy war in Honduras? Quico says: Mel Zelaya’s grandiloquent announcement yesterday that he intends to now lead an “insurrection” in Honduras as he walked out of the US-backed mediation effort in Costa Rica might be just hot air, but it might also be the start of a terrible human tragedy. In the end, it was too much to hope for, thinking Chávez would allow the US the propaganda triumph of having the Arias mediation mission succeed. The proposed compromise (allowing Zelaya back under amnesty but nipping any talk of a constituent assembly in the bud) would have been a disastrous setback for the ALBA block. Because the chavista’s real interest in Honduras is establishing the precedent that leftiss presidents have unbridled authority, regardless of what the constitution says, and have almost a duty to do what they can to stay in power for life. The deal on offer in San José emphatically did not get them there. 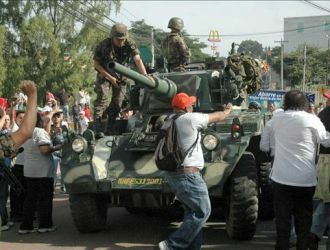 A war in Honduras just might. It’s a thought that’s been batting around the back of my head ever since the Honduran crisis started: with the maximalist rhetoric, the demonization of the other side, the presence of a long, porous border with an ALBA member country, and the region’s history of violence, wouldn’t you say Honduras looks like a perfect stage for Chávez’s long-hoped-for baptism-of-fire? A symbolically loaded shooting war able to establish his brand of legitimacy like the Bay of Pigs established Castro’s? In some ways, the scenario seems scarily plausible to me: Venezuelan money, Venezuelan logistics, Venezuelan weapons, Nicaraguan base camps, Honduran dead. Chávez could set up his own little coalition-of-the willing, a coalition which, if anything, could claim much broader legitimacy than the force the US set up for Iraq, seeing hos the UN General Assembly voted virtually unanimously to reinstate Zelaya. Post 2 of 100. Just warming up. Previous articleWhy on earth would you want to write 100 posts in five days?